You could easily do this in the crockpot too. 5 hrs on low. 1. Cut cream cheese into blocks. 2. In a large pot, Mix broth, tomatoes, cream cheese, basil, salt and pepper, and Splenda and heat, stirring until cream cheese melts. 4. 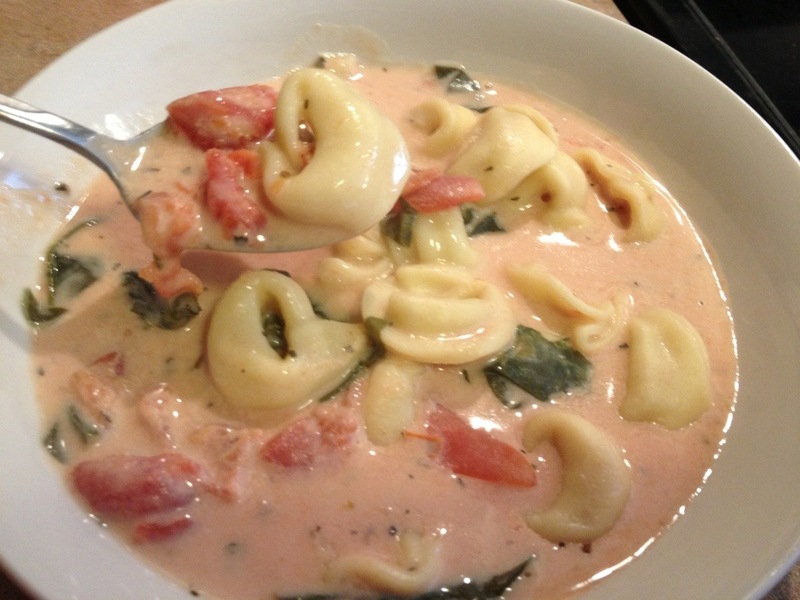 Add spinach and tortellini and heat on warm, stirring regularly. 5. Heat for 10-15 min. This was incredibly easy to make. Incredibly filling and just down right delicious! So glad you liked it!! Thank you for sharing your feedback! Don’t forget to rate the recipe on the star scale up there^^^^. Thanks Josh! Made this for my family tonight for dinner…it was SOOOOO good. We had it with a side of grilled chicken. Everyone ate it up and they were asking for more!!! AWESOME!! !